Recently we showed how a set of leaf springs with a forward bias (ala Mopar SS springs) could be used sans any other traction devices. In that article, we mentioned there are a few more things you can do to enhance traction. Those things are leaf spring bushings. Stock bushings were always encased in rubber and aren’t particularly heat- or chemical-resistant. It’s no secret that rubber bushings deteriorate over time. On a car that could be five or six decades old, the rubber will either be on the verge of disintegration or approaching it. The reason rubber bushings were used in the first place was because it made for a good vibration isolator (it’s soft). That makes the ride agreeable to many consumers, but it also robs your car of performance because the bushings deflect. In a typical drag race car, it’s not uncommon to replace the rubber bushings with solid aluminum ones in each leaf spring eye. The solid bushings stop the squirm and wasted motion (found with stock rubber bushings) as torque is applied to the rear axle assembly. 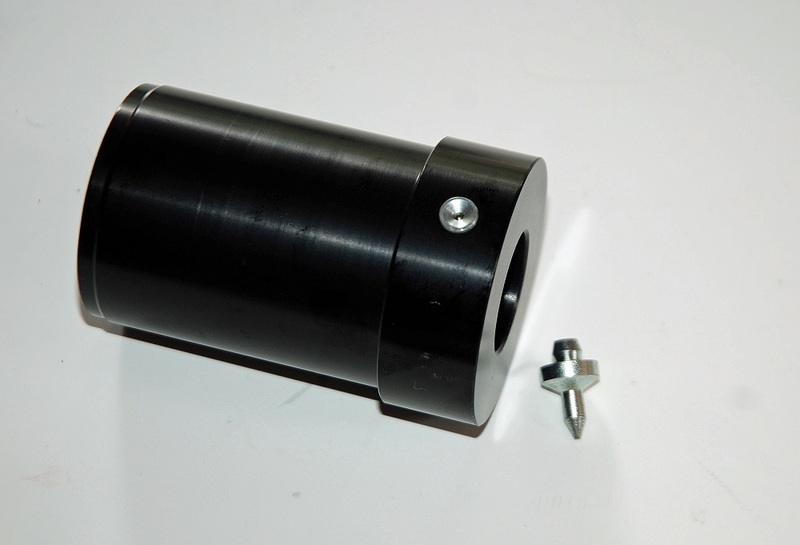 The solid bushings work because there’s no deflection. Unfortunately, solid aluminum bushings have issues too. It’s common for a steel bolt or steel sleeve to seize inside an aluminum bushing. Basically, the dissimilar metallic parts are galling. Cars aside, this happens in many applications. 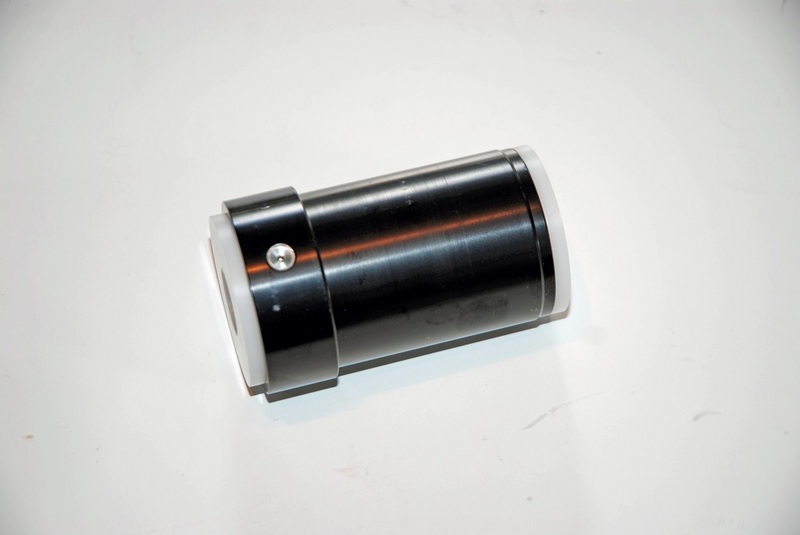 Some drag race-only bushings have no means to grease or lubricate the bushing. 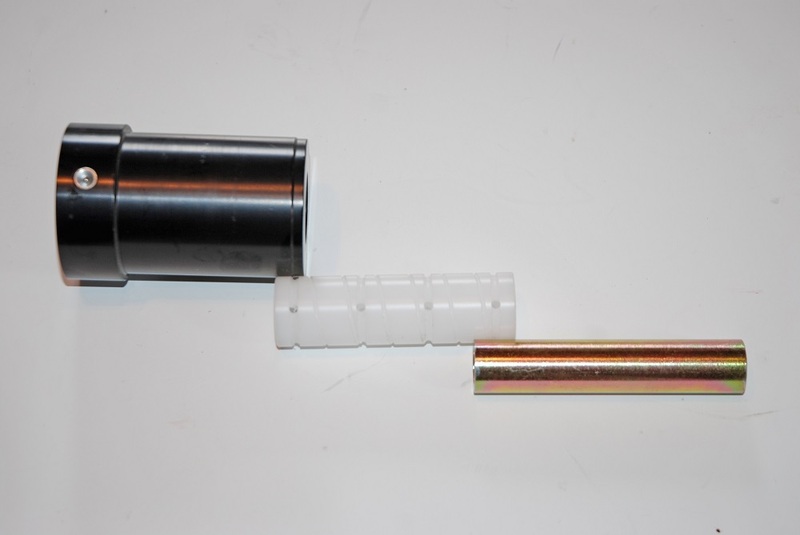 One of the best solutions is to use an aluminum bushing with a thermoplastic liner made from polyoxymethylene. This is an engineered thermoplastic used in precision parts that mandate low friction, excellent dimensional stability and high stiffness. Polyoxymethylene is also known as Ceclcon, Ramtalm, Duracon, Keoitak, and Delrin, which is what we will use for this article. That’s all good news, but there’s more: Some companies (Detroit Speed is a good example, and the subject of our photos) manufacture leaf spring bushings that combine the attributes of both aluminum and Delrin. 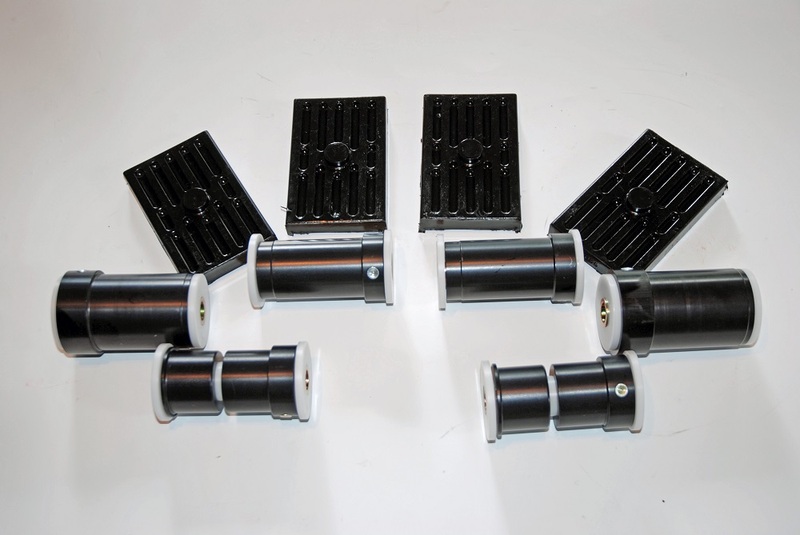 Essentially, the body of the Detroit Speed bushing is manufactured from aluminum and hard anodized. 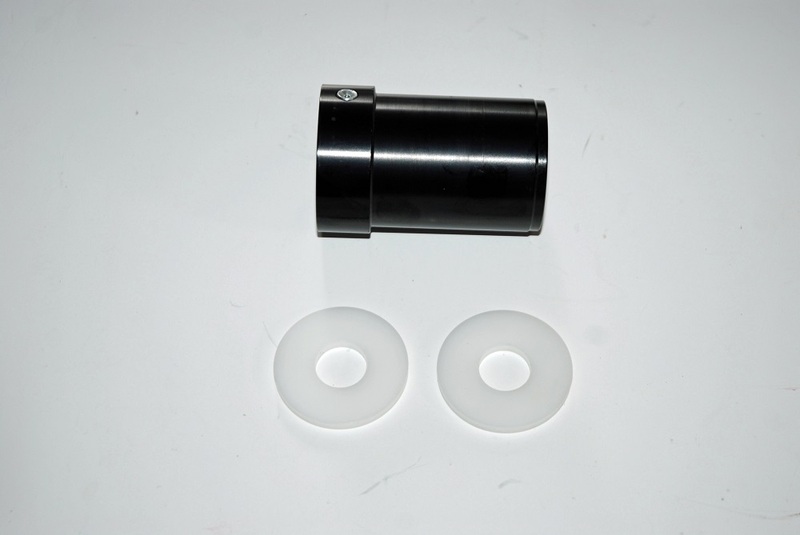 Within the ID of the bushing is a special Delrin sleeve. 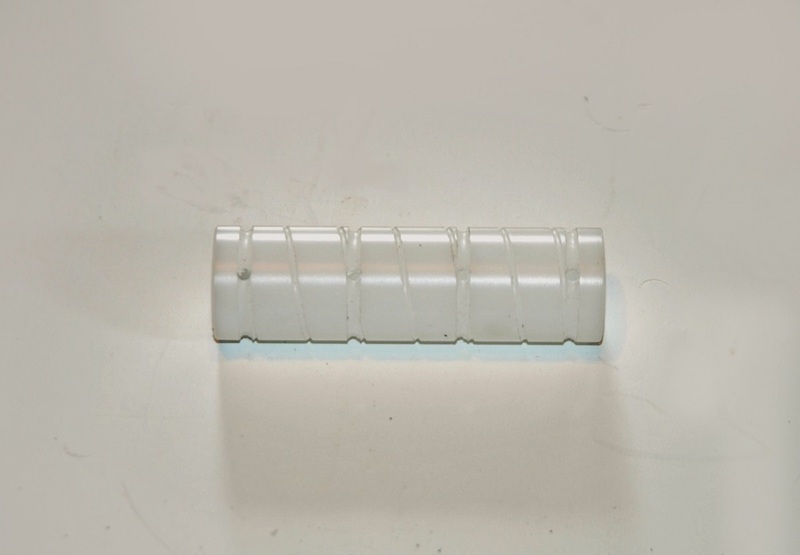 It encapsulates a zinc dichromate-plated steel wear sleeve. The leaf spring bolt passes through that steel wear sleeve. The thick Delrin sleeve is carefully machined with a series of holes and grooves to allow for grease to penetrate to the steel sleeve. On the outboard side of aluminum bushing you’ll find a flush zerk grease fitting. This allows you to grease the bushings periodically (by way of a zerk fitting nozzle supplied with the bushings). In terms of installation, the front bushing presses in just like a conventional rubber bushing (a bit of grease on the OD of the bushing and on the ID of front spring eye goes a long way toward easing the pain of installation). The Detroit Speed bushing is designed to slightly offset the leaf springs inboard which provides more wheel/tire clearance. The bushing is not symmetrical. The outboard side of the bushing has a large step on one side. This step includes the flush zerk fitting and it should be pressed in so that the step is oriented toward the curbside of the car. This feature gives you more wheel and tire clearance over stock bushings (typically, there’s sufficient clearance in the lower leaf spring pin mount area to make up for the offset). You’ll also find there are two large Delrin washers included with the kit. Here, the idea is to reduce friction and wear between the bushing and the front leaf spring hanger (mount). Detroit Speed and others also offer Delrin bushings for the back end of the leaf spring (Summit Racing has a wide range of examples available). In the case of the Detroit Speed bushing shown in the accompanying photos, the bushings are similar to the front spring eye bushings in terms of construction — a hard anodized aluminum bushing with special Delrin wear liner along with a zinc-plated steel inner liner and two large Delrin washers for the outboard sides. Like the front bushing setup, the rear Delrin inner liner is machined with holes and grooves to allow for grease. For most GM applications, the two-piece bushing fits on the rear subframe while the one piece bushing fits the leaf spring eye. Typically, with a Detroit Speed bushing, the grease fittings should be oriented on the outboard (curb) side of the lower bushing and the inboard side of the upper bushing. The flush-mount grease zerks should be oriented facing the front of the car so that you can access them. 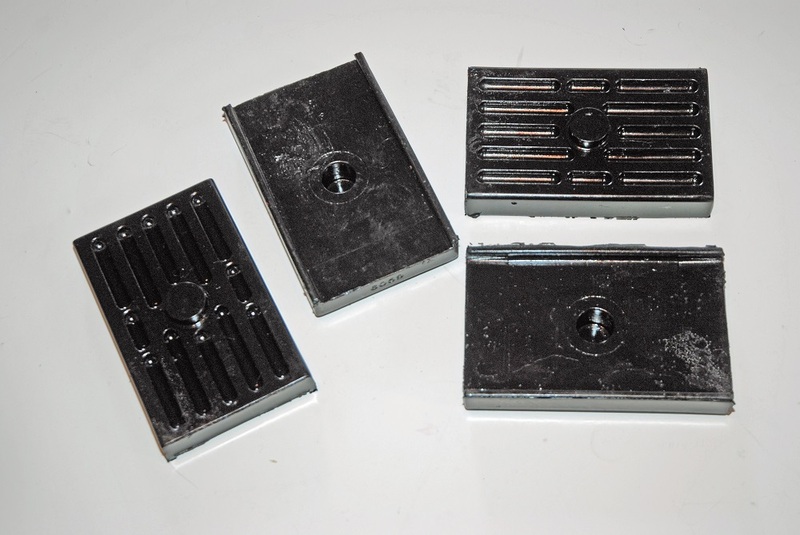 One more thing you can do to control wasted motion in a street-strip application is to replace the rubber leaf spring pads. Over time, these pads wear out and will eventually disintegrate. Summit Racing offers replacement leaf spring pads in either rubber or polyurethane. Polyurethane, or “poly,” is extremely rigid and therefore greatly resistant to flexing. And while it might not be the best bushing material (in comparison to the more expensive Delrin options), it makes for a great leaf spring pad. As you can see, it’s possible to use bushings for added “hook.” Even coil spring cars benefit from Delrin bushings on trailing (rear “control”) arms. The general idea is to remove the wiggle, slop, and deflection common with rubber bushings. ET improves and so does consistency from run to run.